The Diocese of Rochester is insolvent. That’s to say, its cash-flow in falls beneath its cash-flow out. The Diocese isn’t bankrupt, but it has manifestly been living beyond its means. If it hadn’t been for a few £1,000s of liquid reserves (actually, quite a few £100,000s of liquid reserves), they would probably be staring at bankruptcy. Quite what happens when a diocese goes into administration isn’t clear. Presumably, they don’t sell off the cathedral to the House of Saud. The Bishop of Rochester, the Rt Rev’d James Langstaff, has written to all his clergy and told them that their stipends are frozen, recruitment halted, and all non-essential works projects are to be cut. Quite how the Bishop is defining ‘non-essential’ isn’t clear: the National Secular Society might have a few ideas. The objective is to balance the budget, and so austerity is the order of the day. All 239 churches in 216 parishes are expected to tighten their belts. They’re all in this together. The deficits aren’t trivial, either. In 2015 the Diocese of Rochester ran a deficit of £604,000. It was forecast to be £557,000 this year. “This means that our present position is worse than expected because, while this has also been funded from reserves, those general reserves are now almost exhausted,” the Bishop said. Since “the remaining reserves are not sufficient to fund this deficit”, the Diocese is insolvent. Quite why the 2016 deficit is “worse than expected” isn’t clear: presumably, having learned from the state of affairs in 2015, if they did nothing to increase their income while doing nothing to reduce their expenditure, they must have totally expected to be another half-a-million quid down. What would the Financial Conduct Authority make of this? Since the Bishop’s letter evidences a degree of chronic financial mismanagement – for living beyond one’s means year after year is, indeed, irresponsible (if, indeed, not immoral) – there are some serious questions to be asked at a senior level. Does the deficit-addiction precede Bishop James? If so, what did Bishop Michael Nazir-Ali know of the situation? Who authorised the overspend year after year? By what rationale was it nodded through? With what transparency? What accountability? How can the church in Rochester preach about good stewardship if it does not practise it? A prudence of vicars can’t expect an outpouring of BBC/C4 empathy at their impending redundancy: that’s reserved for Tata steelworkers. The media don’t care much for the impoverished labourers who toil in the vineyard of the Lord. Their stipends are now frozen, workloads increased, and ‘Everybody out!’ isn’t an option. 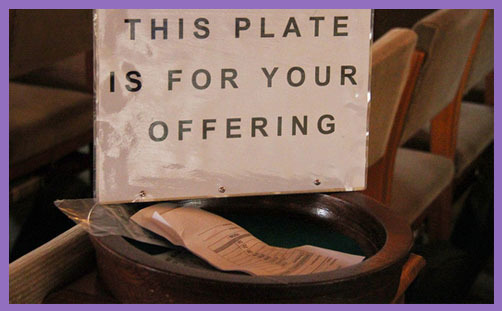 For clergy with children to feed today, ‘the Lord will provide tomorrow’ isn’t a very pastoral or caring response, is it? But why, if the Diocese of Rochester has frozen stipends, postponed repairs on buildings, been forced to rent out its unused vicarages (why weren’t they already doing that? ), cut back on training programmes and basically shown itself to be financially feckless, are the Church Commissioners and Archbishops’ Council throwing more cash at it as part of the ‘Renewal and Reform’ programme? …The aim of the funding is to complement the formula-based funding distributed to dioceses each year, so they can benefit from additional resources to make a significant difference to their long-term mission and financial strength, by supporting major growth and change activity which fits with dioceses’ strategic plans. Proposals will be evaluated throughout to ensure that learning for the wider Church can be captured and disseminated, complementing the new process of diocesan Peer Review, which is also a key part of Renewal and Reform. The funding was awarded after a competitive process, in which dioceses were invited to put forward initial applications to the Task Group. Those proposals which were judged to meet the criteria most strongly were invited to submit detailed project plans. …Rochester: £665,000 to re-establish mission in Chatham Town Centre, planting a new worshipping community alongside missional outreach. There is a certain irony (/irresponsibility) that a diocese which cannot resource its present to the tune of c£600,000 should be given that precise sum to resource its future. What discernment of strategic development does this evidence? What “major change projects” may be initiated if recruitment is frozen? What significant difference to their missional strength is possible if clergy stipends are frozen while new projects are funded? Surely you have to be faithful in small strategic plans before taking on bigger ones? 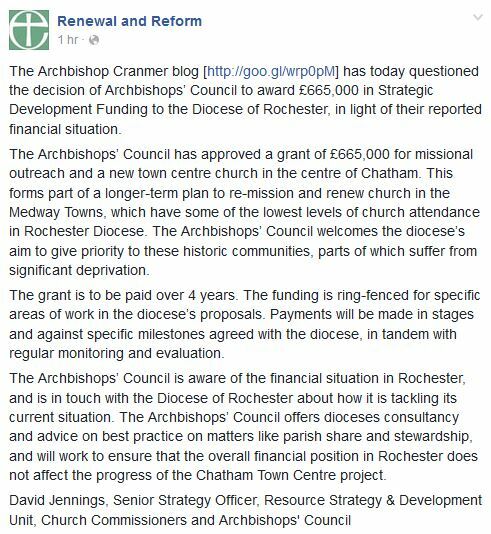 Why are the Church Commissioners trusting the competence of Rochester’s Diocesan Board of Finance? Why are they funding a new worshipping community if the Diocese can’t afford to support existing ones? The new process of Peer Review seeks to ensure mutual accountability over how resources are being used and facilitate shared learning between dioceses about their plans for mission, evangelism and discipleship. This will involve meetings between the senior leadership teams of dioceses and a peer review team. The team will comprise three members drawn from a wide pool of peer reviewers, nominated by dioceses and the Archbishops’ Council, on the basis of their skills and experience and trained for the task. Peer review is good: sharing best practice is good. How else may the task of mission be improved? What is not good is praying for an increase in income from parishes while making vicars redundant or not replacing those which are retiring. Congregations don’t generally appreciate being fobbed off with part-time visiting vicars: they tend to just leave their churches, which means they don’t give, which means income falls, which means more cuts, which means… oh, you get the picture. The faithful, humble, hard-working clergy of the Diocese of Rochester deserve better, and so do the people they serve. Pray ye therefore the Lord of the harvest, that he will send forth labourers into his harvest (Mt 9:37f). Except in Rochester, where the harvest is plentiful, but the labourers must be cut because of past financial mismanagement. Austerity, you see: we’re all in this together. Except for the lost sheep of Chatham Town Centre, who will hear their (ring-fenced?) gospel and be discipled by their (new?) shepherd – to the tune of £665,000.